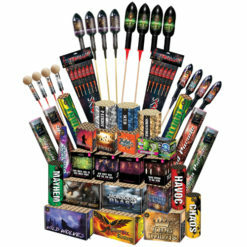 An excellent all-round assortment of large display fireworks. This pack will impress, designed with fewer but larger items, many taken from our stunning individual barrages. Save £130 off our already discounted prices! Add this trio to your armoury. 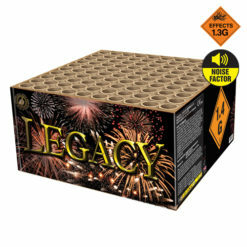 The Ammo Store 3 pack, certainly packs a punch of military proportion. 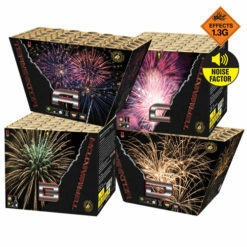 Each firework lasting approximately 30 seconds. With PATRIOT launching a salvo of brocade crown tails. To huge titanium palms with green, red and silver blink. Followed by SCUD which contains astounding brocade pine tails to brocade pine breaks. In addition, the SIDEWINDER barrage offers incredible silver and gold blink tails. To epic wave willow bursts with purple, blue, red and silver blink. Great value 1.3G effects. We’re not playing a game of Chinese whispers here. Beijing Willows is loud and proud. A staggering wide angle volley firing barrage. With huge eruptions of blue star mines to gold leaf bouquets. Blue mines to gold crackling palms. 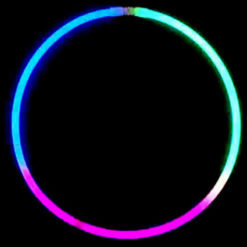 Before blue glitter mines to chrysanthemum willows. 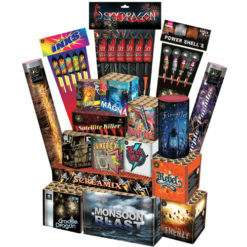 Exploding into life the Phoenix awakens by sending large crackling corkscrew tails twirling into the dark skies above before bursting into huge red and crackling stars, green and crackling stars with a crackling bouquet finale. 100 shots fired, 40 second duration. 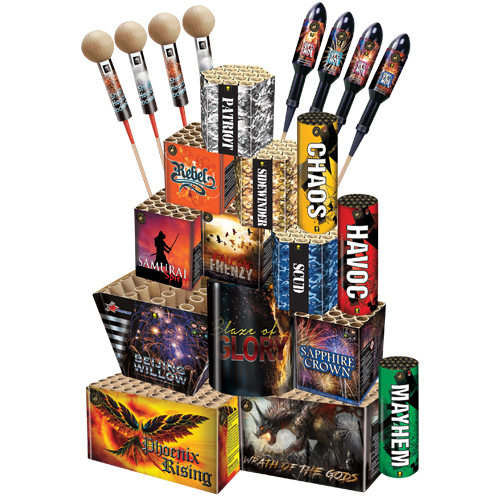 Looking for professional style shell effect rockets, look no further than the Shellhead Rocket 4 Pack. With amazing 1.3g effects and excellent break. Including big gold coconut, silver blink and brocade crown effects. Offering amazing big bursts for the money. 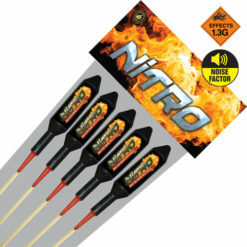 Add these fantastic 1.3G effect rockets to your super show. This pack of four, pack a real punch including red & green peony, silver crown, gold blink willow & crackling cauliflower. Feel the vibes coming from the Havoc Mine. This instant firework mine ejects a column of vibrantly coloured peony mines. Launching into the sky to over 80 feet before massive sky filling titanium crackle bouquets to finish. Quick but breathtaking and loud effects. Send a shockwave through you display with a huge flash of brocade glitter mines into vast brocade crown bouquets. Quality loud noise from this large mine. The package was excellent and very well recieved by our audience. The only improvement would be a few more rockets. Delivery was also very prompt. 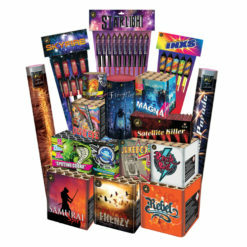 An excellent all-round bumper assortment of large effect display fireworks. As a result the Pro Shop Bumper pack you will impress. Designed with fewer but larger items, that pack a punch. 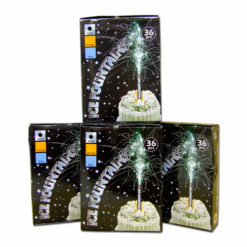 Many taken from our stunning category 2 and 3 individual cakes and barrages range. Another plus is the addition of some excellent 1.3g effect firework rockets. Not only do you save £130 off our already discounted prices! You get all your safety goggles, gloves and safety lighters included. Plus a recommended firing order and safety instructions.